The Nine of Cups in a Tarot reading is about achieving not just victory and success but that of a state of physical well being bring about a feeling of all round contentment. It may show the end of a long struggle in which you have achieved your wishes and desires and have shaped your own destiny from which you can show generosity towards others, clearly a good sign with regard to attracting and maintaining relationships. In the reversed position it can show that you have been spoilt by your gains, it has gone to your head and not sure what to do with them, you could be taken advantage of. A goodly personage has feasted to his heart’s content, and abundant refreshment of wine is on the arched counter behind him, seeming to indicate that the future is also assured. The picture offers the material side only, but there are other aspects. Concord, contentment, physical bien-être; also victory, success, advantage; satisfaction for the Querent or person for whom the consultation is made. Truth, loyalty, liberty; but the readings vary and include mistakes, imperfections, etc. Of good augury for military men. 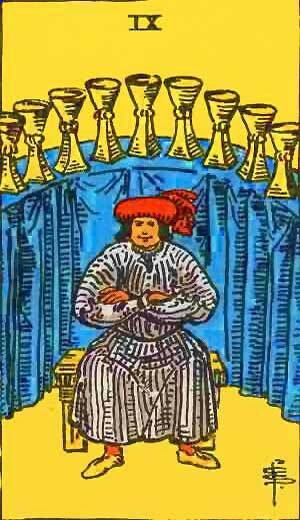 Nine of Cups – Victory, Advantage, Success, Triumph, Difficulties surmounted. Victory, success, advantage, gain, triumph, superiority, etc. “The heart’s content.” (Waite) Reversed, the card seems even better: Sincerity, truth, loyalty, good faith, frankness, ingenuity, opening the heart, liberty, familiarity, etc. Concord, contentment, physical well-being. Many of the addictions are very suggestive of the influence of the Water on the house of the heart, the Fifth; and we can only say, that they are fairly exact and to the point. The card must signify the realisation of hopes and wishes lying in one’s own power or destiny, making one enjoy the fulness of life, and adopting the philosophy of Epicurus. There is no evil in it. It shows goodness and a jovial disposition, not only contentment and happiness in one’s self, but also, owing to Leo-influence, the love of bestowing hospitality on other people and helping them. Here the winged disk is stable in flight, and comes straight ahead, in contrast to the instability suggested by the four wings on the preceding card. This is the same as the Nine of Hearts, and is the traditional wish-card. It owes this significance to the original Tarot meanings. Second decanate of Pisces, March 1st to 10th, under the rulership of the Moon. Complete realization of desires; almost perfect pleasure and happiness; wishes fulfilled; physical well-being. Vanity, conceit, egotism; foolish generosity; easily led; one spoilt by prosperity. More information on the Nine of Cups Tarot card. This entry was posted in Tarot, Runes and Divination and tagged desires, destiny, evil, feelings, heart, love, nine of cups, pregnancy, prosperity, tarot, the moon. Bookmark the permalink.